Jacob Hall in his favorite place at Steinbrenner, the kitchen. Jacob Hall is a senior culinary student hoping to go to the Culinary Institute of America next fall. 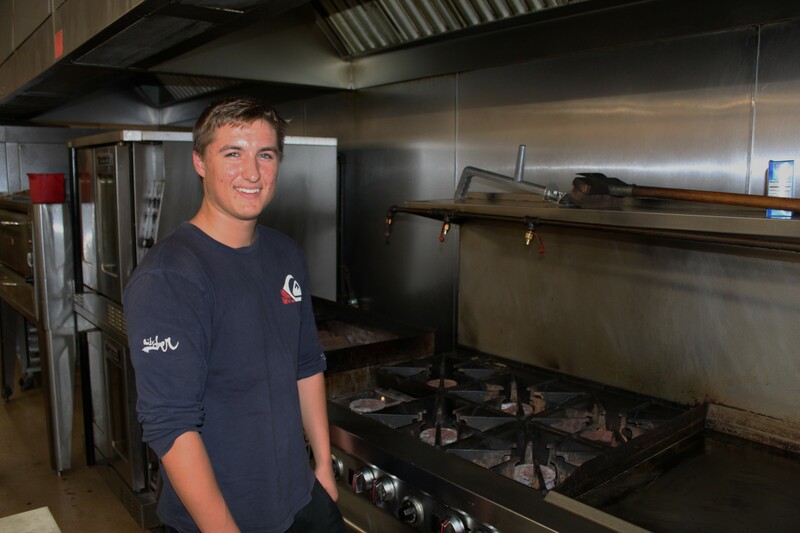 Jacob Hall is a senior at Steinbrenner High School working his way to study culinary arts after he graduates. While working to achieve his dream of culinary school he is also actively involved in volunteer work for BETA and is a member of the swim team. However, his favorite thing to do is be in the kitchen. When asked about the most gratifying experience he gained from culinary he recounted a trip to feed the homeless in freshman year. He pulls most of his inspiration to pursue culinary school and work ethic from the two culinary teachers Chef Scarpa and Chef Goldstein. He says that he learned from them to “ just keep trying and you’ll get it one day,” a motto he chose to follow throughout his high school career and application process and will continue to follow during culinary school. Hall began chasing his dream to cook when he began the culinary program in sixth grade and then continued in the program throughout his high school years. Today, Hall works for Steinbrenner’s culinary lunch service during fifth period and continues to learn how to make new things almost every day. He says that his favorite thing he has ever made was “sous vide steak,” and he continues to create new personal favorites in the kitchen and learn new techniques that he can use at home. However, the biggest thing he has gained from the culinary program is many memories and crazy stories he can tell his friends and family. Hall is one of the culinary students at Steinbrenner that will be continuing on to technical education to work in the culinary industry. He is looking forward to hopefully going to The Culinary Institute of America next fall after he graduates to create more memories and a lasting career in the culinary industry as a chef.